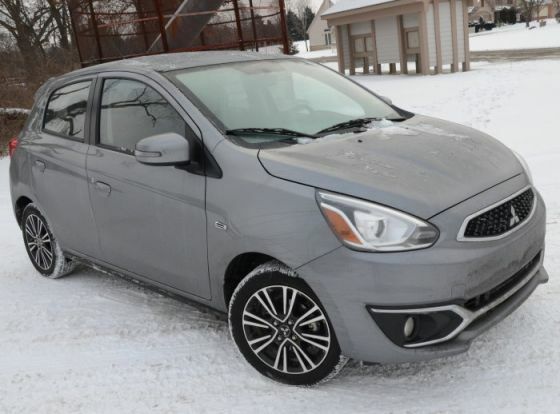 I relied on the 2018 Mitsubishi Mirage GT to get to and from the 2018 North American International Auto Show in Detroit and during that week of battling winter weather and city traffic, I found that the compact 5-door is a great winter commuter car for the price. The Mitsubishi brand doesn’t get a whole lot of attention in the current American auto industry. The Japanese company has done away with the sporty cars that helped the brand flourish in the 90s, turning instead to a lineup of SUVs and super-efficient compact cars. As a result, the brand has gotten lost in the shuffle of the dense-packed compact and mid-sized SUV segments, but a week in the Mirage GT showed me that anyone shopping for a compact 5-door should check with their local Mitsubishi dealership before making a purchase. I took delivery of the 2018 Mitsubishi Mirage GT for the week of the 2018 North American International Auto Show. Of course, in fine Detroit fashion, it was bitter cold that week and we got some snow for the morning rush, meaning that I had to make the 50-mile drive from my home to “the D” on roads that were just snowy enough to turn the early-morning commute into a sloppy, slippery headache. Fortunately, I was driving the Mitsubishi Mirage GT with the standard all-season tires. That might sound crazy to those people who have little regard or respect for the Mitsubishi brand, but this tiny 5-door really proved to be a great commuter car on the cold days. Here are my 5 reasons why the 2018 Mitsubishi Mirage GT is a great winter commuter car, even in the snow. Each morning, my drive into Detroit began in the sub-freezing temperatures of my driveway. 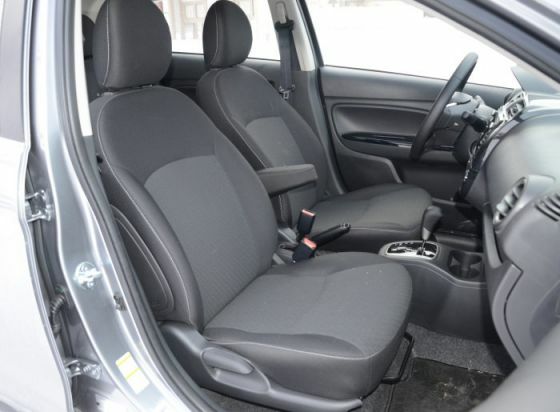 Unlike key 5-door competitors such as the Toyota Yaris and the Nissan Versa, the Mirage GT has heated seats, so I started the car in my driveway and let it warm up for a few minutes before hitting the road. In that short amount of time, the heated driver’s seat was toasty while the HVAC would already have some warm air circulating through the cabin and de-icing the windshield. Within the first 15 minutes of my daily commute, the cabin was hot enough for me to forget about the freezing outside temperatures. Other vehicles take a much longer time to warm up, especially those models that don’t offer heated seats, so for anyone who makes a daily commute in a very cold climate – the Mirage GT gets you warmer sooner than the competition. The 2018 Mitsubishi Mirage GT is powered by a 1.2-liter 3-cylinder engine with 78 horsepower and 74lb-ft of torque. Based on the high output of many modern engines, those numbers seem incredibly low – and they are – but that is plenty of power for this small hatchback. More importantly, the combination of those svelte power numbers and the narrow tires allow the Mirage to plow along snow-covered roads. In deep, unplowed snow around my neighborhood, the Mirage GT would spin the tires ang dig its way forward while on the highways, where the snow was packed down to the road surface, the little Mitsubishi was surprisingly surefooted. Even in the Detroit slush in stop-and-go traffic, I was never worried that the Mirage was going to leave me stranded. 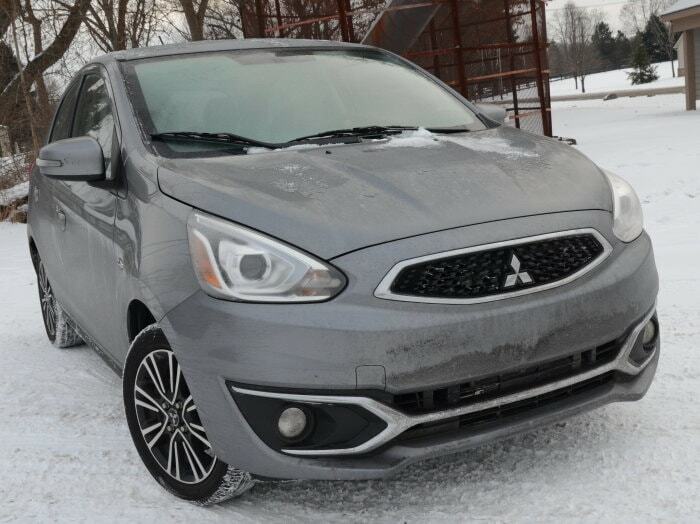 Sure, a compact with snow tires or an AWD vehicle like an SUV or a truck will perform better in the rough winter conditions, but as front-wheel-drive cars with all-season tires go – the Mitsubishi Mirage GT is great in the snow. 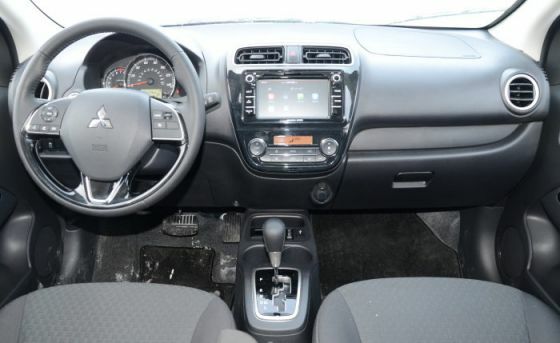 The Mitsubishi Mirage GT is a compact hatchback, but the engineers made the most of the available interior space. The front seat offers plenty of leg, hip, elbow, shoulder and head room for the driver and passenger, with a fold-down armrest for the driver. Some small cars don’t have a center armrest and I hate that, so I was glad that the Mirage GT had one during my lengthy commute into Detroit. The Mirage GT also has two large cupholders and a place to stow my phone while driving, with large pockets in the door offering another cupholder. Many compacts remove much-needed stowage space around the driver to make more seating space, but the Mirage GT has lots of seating space and plenty of places to store things while on the move. 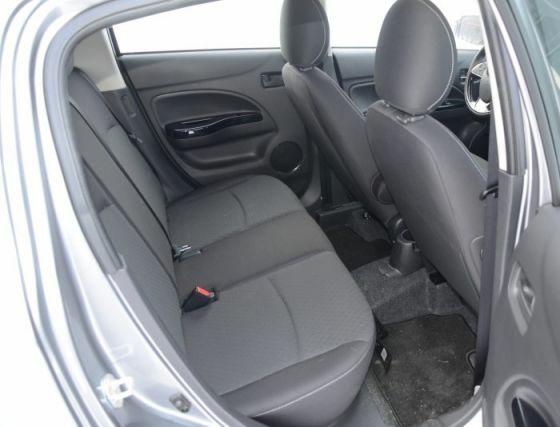 As for the rear seat, it is predictably tight, but there is enough leg room to comfortably fit two adults of average (6-foot or under) height for the average commute. You aren’t going to want to put four 6’6” guys into the Mirage GT for a drive from LA to Vegas, but for the daily drive to the office – this car can seat four adults. More importantly, it has plenty of room for small family with one kid, all while still offering a nice amount of cargo space in the rear. The 2018 Mitsubishi Mirage GT tiny 3-cylinder engine mated to the Continuously Variable Transmission (CVT) carries EPA fuel economy ratings of 37mpg in the city, 43mpg on the highway and 39mpg combined. Even though I spent plenty of time sitting in traffic and spinning my tires in the snow, I averaged around 41mpg on my drive to and from Detroit each day while I averaged just under the predicted number for the week – getting 38.6mpg overall. Had the roads been dry, I believe that the Mirage GT would have averaged better than 40mpg for the week, but even in poor road conditions – it stayed in or around the 40s. Finally, my 2018 Mitsubishi Mirage GT test car had a price-as-tested of $17,585, including the carpeted floor mats ($125) and the destination fee ($865). That price includes the 6.5-inch touchscreen infotainment system with Apple CarPlay and Android Auto capabilities, heated front seats, push button start, HID headlights, fog lights, LED taillights, alloy wheels, a backup camera, steering wheel infotainment controls, keyless entry, power windows and power locks. That price point makes the Mirage GT less expensive than the Toyota Yaris and Nissan Versa – neither of which offer some features like the heated seats – and to get comparable features in the Honda Fit, you have to go with the EX-L model that starts over $20,000. In other words, if you are looking for an affordable and efficient compact hatchback that has more standard features than the competition for less money – the 2018 Mitsubishi Mirage GT might be your ideal new car.